I had the best of plans for today. The LSH was due back from Malaysia, but he said he would get the 12.30pm airport shuttle to Manosque. 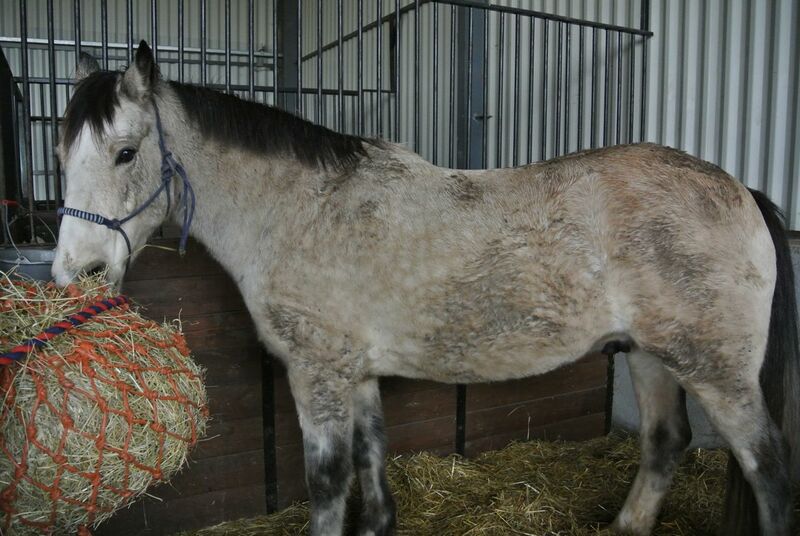 I would be free until about 2pm – plenty of time to ride both horses, clean up Flurry and plait his mane. Unfortunately (he thought it was a good thing at the time) the flight from Malaysia got into Paris early and he was able to switch to an earlier flight to Marseille. He thought he’d be on time for the 9.30am shuttle – great! I could collect him at 11am and have the rest of the day free. But this is where things went wrong… the Marseille flight got in late and he missed the shuttle. He would have a two and a half hour wait at the airport followed by a one and a half hour bus-ride with a further half hour in the car – all this after a thirteen hour flight. “I’ll come and get you,” I said, nobly. The drive to and from Marseille took longer than it should have (protesting truck drivers in Aix-en-Provence) so we finally got back at 1.30pm, having paused in McDo to refuel myself on the way. I headed up to the horses. There was rain forecast for later in the day, but I was confident it would hold off… hey, those clouds look very black over Reillanne… SPLAT! the first drop hit my windscreen… and that was it. The rain was down for the afternoon. No worries, I thought. Flurry has been really clean every time I’ve ridden for the past few weeks. Why would today be any different? Well, because I’m doing dressage tomorrow, of course. Sigh. There were two clean horses and one dirty horse waiting to greet me. Guess which one was dirty. And, worse still, wet. First thing to do was start the drying process. 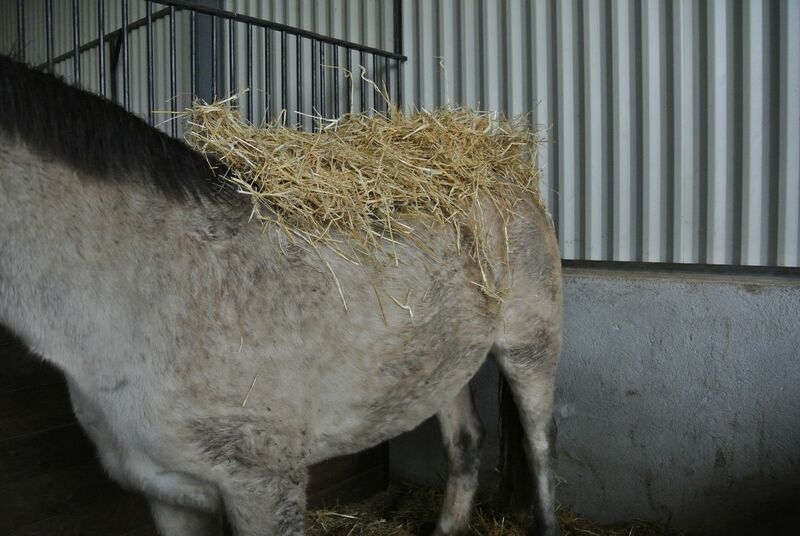 I put him in an empty stable and thatched him – a layer of straw under his inside-out turnout rug. I trimmed his mane a little and got to work on his plaits. Ten of them. I’ll roll them up tomorrow before we leave (in the dark. See below). 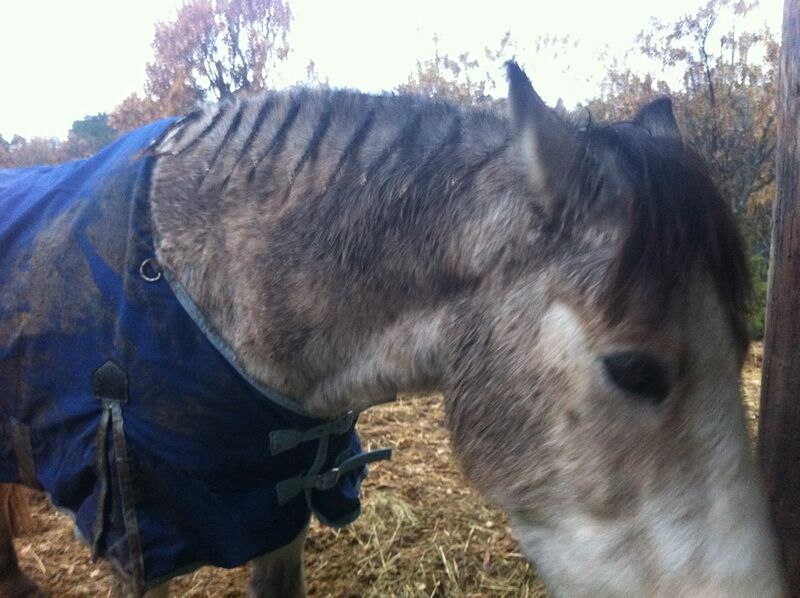 By the time I was finished, he had dried off a bit and I scraped the mud off the saddle area, tacked him up and threw on a waterproof exercise sheet. I’d had the foresight to store it in the tack room a few weeks ago, but not the hindsight to remember it was there until I was nearly finished plaiting! Off to the arena with us, ran through the test a couple of times. Alexandrine had shortened the arena and set up the letters as they will be tomorrow. OMG I hadn’t realised how small a 20×40 is… I’ve been spoiled! It’s very tight and things happen very fast, but at least it’s a very simple test. 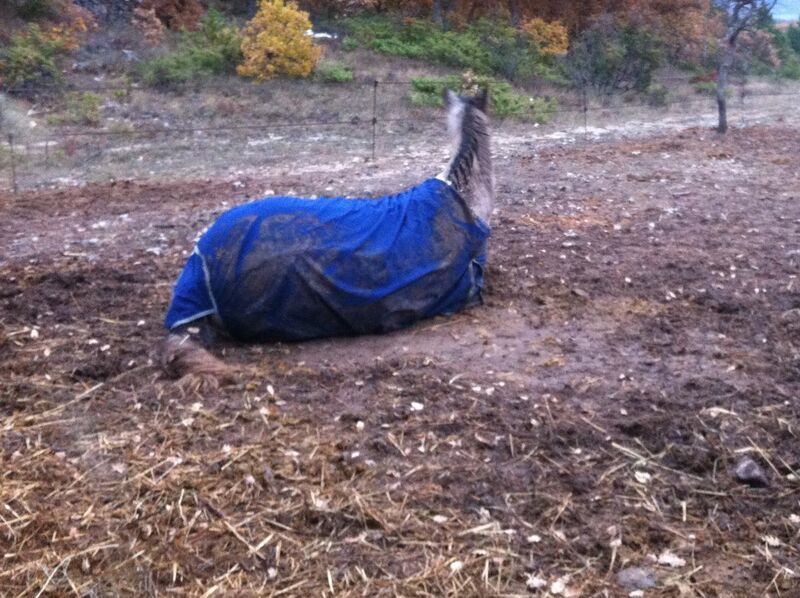 He was completely dry under the sheet when we had finished, so I scraped off the last of the mud from his rump. Spotless! 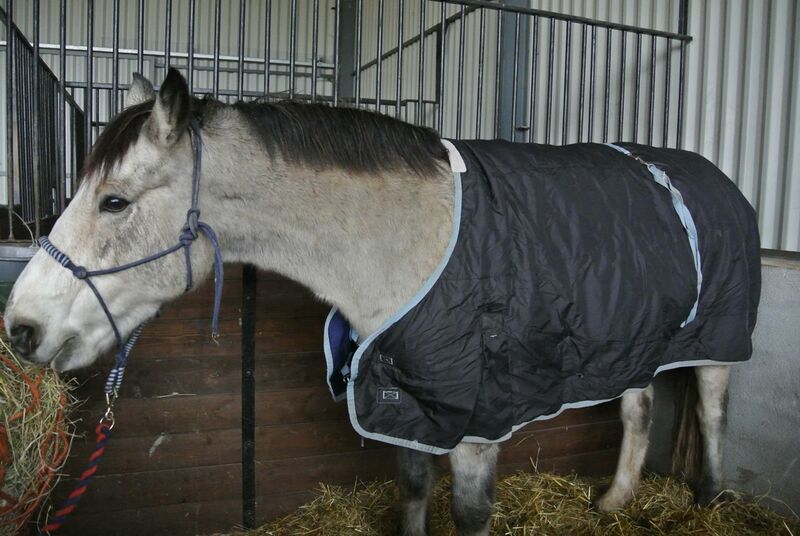 Now to put his turnout rug on to keep him clean… Well, most of him. It doesn’t cover his neck, of course. Or those lovely plaits. …was plaster his neck and plaits with mud. Now for the bad news : I’m on at 9.06am. We need to leave at 7.20am, ergo I need to be up there to scrape that (hopefully dry) mud off his neck at 6.45am, ergo I need to leave the house at 6.30am, ergo I need to be hauling my carcass out of bed by 6am at the latest. Why am I doing this again – for FUN? Where’s the fun in that? Relax, smile, and have fun. Good luck!! Arrrgh! What a beastie you are Flurry! Good luck tomorrow! Never heard of thatching, makes sense tho. Do have fun ~ remember to breathe. Can’t wait to hear about it! I’ve never heard of that thatching, interesting. 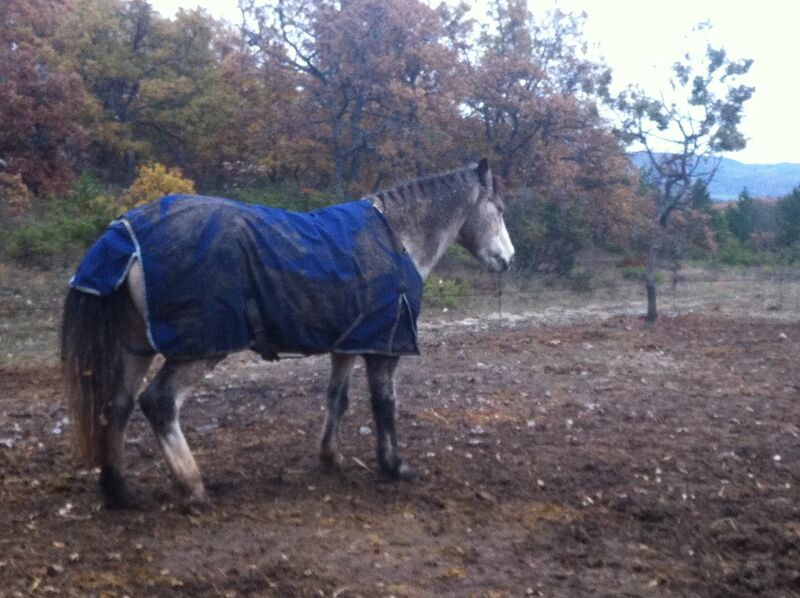 Here is to hoping for a relatively mud free pony when you arrive. How do you say “Not on your life?” I might need that some day!